This entry was posted in Politics, Pop Culture and tagged Republican. Join Paul and Tim as they explore the spew that the president delivered on Tuesday night. We will also have our assessment on the state of the union and give you our morons and heroes of the week. Watch live here. 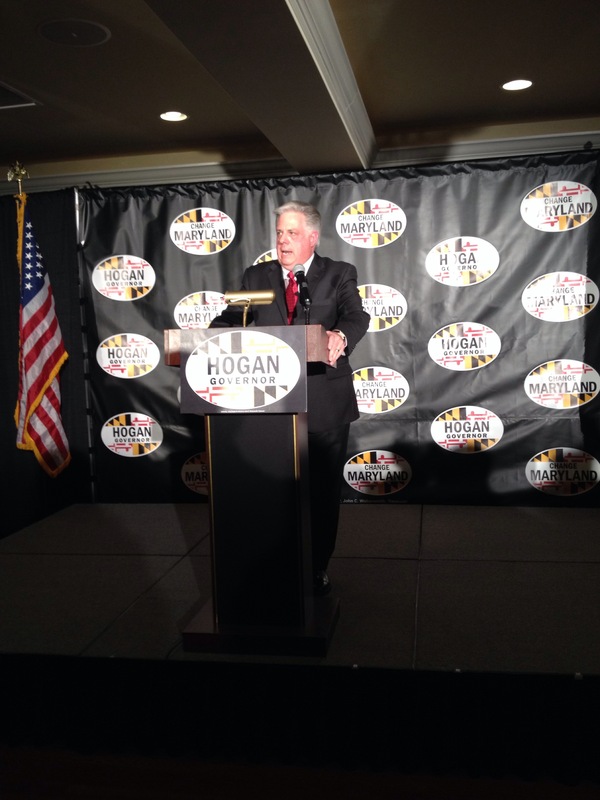 Tonight in a ball room at Mike’s Crab House in Annapolis, Republican gubernatorial candidate Larry Hogan held a rally after his campaign announcement last week was cancelled because of the weather. At the rally tonight Hogan promised three items he will do when governor, including lowering taxes, considering the middle class, and restoring integrity to the office. 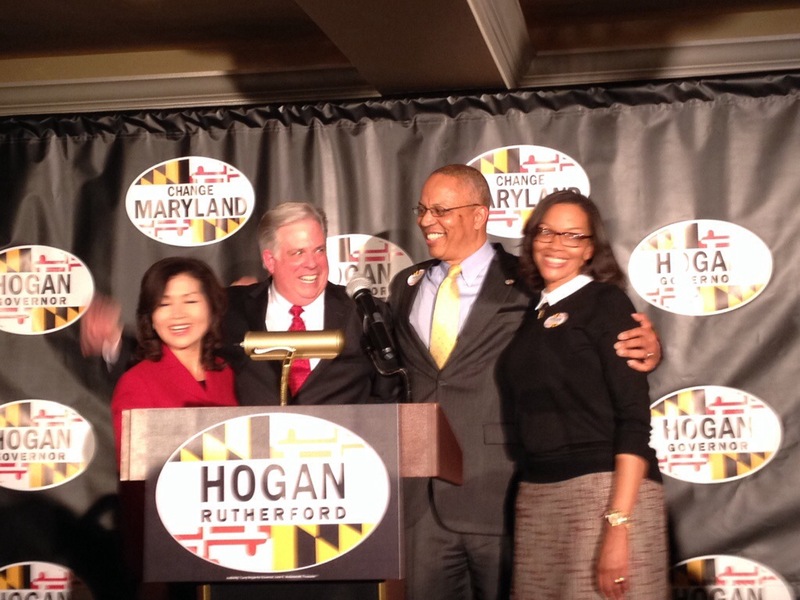 Hogan was brought to the podium by his daughter Jamie and after his speech announced his running mate, former General Services Secretary Boyd Rutherford. Rutherford gave a speech promising to use his management skills in the position of lieutenant governor. A position that has no constitutional duties. As Rutherford noted this is particularly apt given the current lieutenant governor Anthony Brown’s failure to oversee the roll out of the Maryland health exchange, his primary task the last two years. Brown is of course seeking the Democratic nomination for governor against current attorney general Doug Gansler. Hogan in his speech openly questioned the wisdom of electing either the current number two or three man in Maryland government. The crowd at the rally was quite enthusiastic, though the ballroom was only half full and divided by the cameras set up to record the speeches. Several current elected Republican officials were in attendance along with Hogan’s father, former Congressman and Prince George’s County Executive Larry Hogan, Sr.
Hogan faces a Republican primary against Harford County Executive David Craig, Delegate Ron George, Charles Lollar, and Brian Vaeth. The Maryland primary is June 24. Tonight Tom and Jimmy return to the airwaves of Free State Radio – with an exciting show lined up for you. – Are House GOP members turning their back on America? Why a push for an Immigration bill when we’re concerned about jobs? This entry was posted in Uncategorized and tagged barack obama, Conservative, Immigration, Minimum Wage, Obamacare, Republican, State of the Union. First, we at Free State Radio continue to express our condolences to those harmed at Columbia Mall yesterday and to all of those who have suffered from senseless acts of violence. On Thursday, Governor Martin O’Malley gave his final State of the State address in Annapolis. We covered it with aplomb on Thursday night’s Non-Aggression Principle. You can watch our Mystery Science Theater 3000 take on it here. If you want to watch the unannotated version you can do that here. Many news outlets have focused on the misrepresentations and factual errors in the speech. Others have noted those errors and the odd reference to noted anti-semite Henry Ford that was immediately picked up on our Thursday show. The Daily Record shows the strong lack of rhetorical innovation in the speech.The Republican candidates for governor responded in an expected manner. But what really struck me about the speech was not the lies about cutting $9 billion dollars from the budget when the budget has gone up $10 billion dollars. It was not the rhetoric about our schools when we are dead last in the 8th grade achievement gap. It was not even taking credit for things that have happened routinely and with greater success around the country such as the lowered crime rate and lower infant mortality rate. No, what struck me about the speech was Governor O’Malley’s seeming lack of charisma and lack of enthusiasm for his policies and “achievements.” It just struck me as insincere. This is a man who wants to be president someday. A man who sold out Baltimore to a) the highest bidder and b) a higher office. He made the rounds on the talk show circuit in support of President Obama’s reelection bid to raise his national profile. He supported Hillary Clinton in her bid for president in 2008 so he is presumably not on her enemies list and is a candidate for vice-president or at least a cabinet position in 2016. But from his body language, the tone of his voice, the seeming lack of vetting of the actual speech, the clichés sprinkled throughout, and the lack of care in delivering it, it just seemed as though his heart was not in it. Now it may be that even he does not believe the manure that he is spreading. He has never been much of an ideologue. He came around on gay marriage, the death penalty, and gambling expansion only when politically advantageous. He is still in favor of marijuana prohibition and wants to be seen as tough on crime even though it is not a particularly progressive position. Maryland is not very liberal, not compared to western states, but it maintains that good ‘ol boys network of east coast politics. O’Malley’s father-in-law was attorney general after all. This is especially interesting because O’Malley has always viewed himself as a rock star. Between his band, the sleeveless shirts, and the unbridled ambition he has not been a shrinking violet. To watch the speech on Thursday, his last in this phase of his life and career, and to see a man just going through the motions was shocking. It was unemotional and fake. If this is the man that runs for president, well, expect DLA Piper, Whiteford Taylor or Miles & Stockbridge to have a new partner rather soon, because O’Malley is not going to go very far. Perhaps a position in the senate could be had when Barbara Mikulski retires, but, if he is hell bent on running for president the timing may not be right for that. The most telling moment of the speech was not when he had a Ron Burgundy moment and read the word conclusion off of the teleprompter. No the most telling moment was when talking about how the only things worth doing were things that “might break your heart.” What does that mean? It was rhetorically empty and was delivered with a false tear in his eye. It was hollow. He was going for the big finish but fell flat. Falling flat may become a theme of his tenure as governor and his political future. Howard County police are investigating a shooting inside the Mall in Columbia. Three people are deceased. One subject was located near a gun and ammunition and is believed to have likely been the shooter. There have been no reports of any shots fired since the body was discovered. Police believe the mall is secure at this time. They are asking people still inside to stay in place until police can clear them in a safe and orderly fashion. It may take a few hours to complete this task. The mall has been closed to the public. Detectives have not yet confirmed the identities of any of the people involved. A motive is unknown at this time. Additional details will be released as they become available.